The run-up to HIMSS is typically packed with marketing, but this year has been incredibly slow. As I scanned the Monday Morning Update, this ad from First Databank caught my eye. I’m pretty sure no one in their right mind would electively join a Meaningful Use club (unless they had some sadomasochistic tendencies), but it was catchy and smart. In fact, so catchy and smart that I might borrow their “varsity” idea. We typically have a theme for each year’s major EHR upgrade and I’m liking the idea of awarding varsity letters to our next class of super users. There are only four more postal days until I board the plane for Chicago, so if vendors were going to try to reach CMIOs by snail mail, they’d better already have their marketing pieces on the way. There are usually several pieces that arrive the week after HIMSS and I hope their senders at least got a bargain when they chose PR firms that wouldn’t get the message out on time. My administrative assistant is getting seriously depressed at the lack of entertaining pieces – usually he enjoys making fun of the poker chips and other items, but there hasn’t been anything interesting this year. The weekend email did bring a heartfelt apology from Nordic President Drew Madden, who heard about my dis-invitation from their HIMSS event. It sounds like they’re still working on right-sizing given their venue and have been able to expand capacity. Being part of the HIStalk team, I certainly understand how crazy it can be to find your event turning into the hot ticket. If I can figure out how to re-RSVP and stay anonymous I’ll certainly give it a go. I appreciate the personal contact and his kind words. Speaking of HIMSS events, I’ve finally locked in my wardrobe for HIStalkapalooza. I’m really a jeans and boots girl at heart, but do love dressing up. It looks like the Chicago weather is going to be fairly cooperative and I’ve got plenty of other casual-dressy events, so this year’s red carpet look is going to be decidedly formal. I was completely outdone by Lorre, last year so it’s time to catch up. I’m still waffling between two different pairs of stunning shoes and will be wearing them around the house this week in the hopes that I’ll be able to decide. There’s nothing that can make you feel classier than folding laundry in heels and pearls. Eat your heart out, June Cleaver. There are very few people from my day job who will be attending HIMSS, so I have a long list of booths to try to visit. A friend of mine recently clued me in to Humetrix, which offers several different smartphone apps. Their iBlueButton offering allows patients to store, aggregate, and share personal health data. 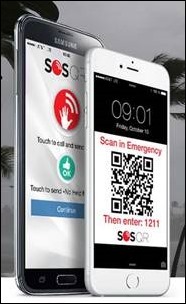 SOS QR allows patients to create a record of emergency health information and then generate a QR code that can be displayed on their phone’s lock screen. First responders or healthcare providers can use the code to access critical health information during an emergency. A premium version allows patients to send out SOS messages to their emergency contacts. Although it seems like these would be good for older patients or those with complex health needs, for young active patients who might wind up with a concussion or sports injury, it’s a great idea as well. It took me all of three minutes to create my record and there’s a certain peace of mind knowing that if I get loopy during my next half marathon, someone might have access to better data than what I illegibly scribbled on the back of my race number bib. Humetrix announced their Tensio app at the Consumer Electronics Show and they’ll have it at HIMSS. I’m looking forward to seeing how they use HealthKit data to engage patients for disease management. The annual HIStalk guide to HIMSS is out and lists sponsor booth numbers as well as blurbs about swag and other giveaways. Several sponsors are donating to charities if you stop by, so be sure to visit AirStrip, Divurgent, and Orion. The Guide is also a great way to plan your route for complimentary drinks and snacks (cocktails at Billian’s, coffee at First Databank, scones at MedData, smoothies at PatientKeeper, and of course candy at PerfectServe). HCS Health Care Software, Inc. is hosting “a night of baseball, beer, and burgers” near Wrigley Field – check out the Guide to see what else you might be missing. What’s your HIMSS15 exhibit hall battle plan? Email me. I think the lack of mail might be a sign that the industry has matured in many ways and the golden age of EHR is over. I think many healthcare IT companies are struggling to stay around and we’ll see many fall off soon. I’ve heard of a number of companies that aren’t exhibiting at HIMSS and are only sending a skeleton crew this year. Might be a sign of HIMSS growing so big that it’s hard to find value outside of perception. However, I think the market is going to hit some harder times.